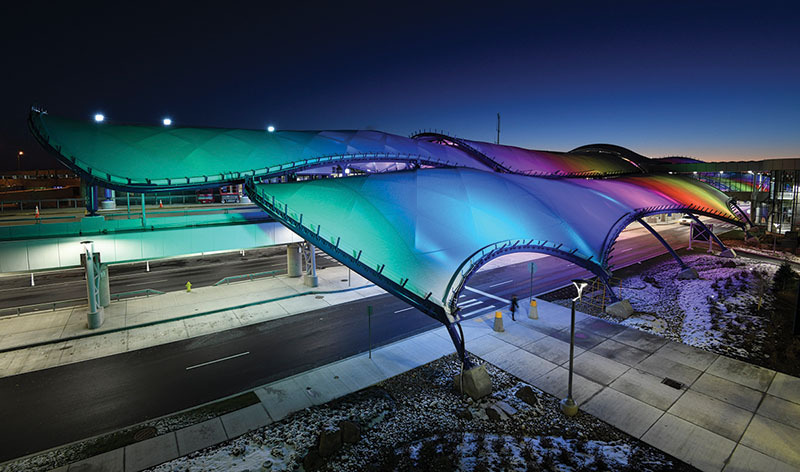 Rochester, NY In October 2018, the Greater Rochester International Airport (ROC) completed a comprehensive $79 million terminal transformation bringing 21st Century technology to today’s air travelers. ROC participated in the New York State Upstate Airport Economic Development and Revitalization initiative introduced by governor Andrew Cuomo. ROC aggressively competed for New York State Department of Transportation (NYSDOT) grant funding by submitting a thorough proposal along with over 70 letters of support from airlines, the Transportation Security Administration (TSA), area business and higher education establishments to initiate a large-scale terminal renovation and revitalize ROC’s strength in the competitive aviation industry. Along with the one-time state funding source, ROC committed Passenger Facility Charge (PFC) revenue, Federal Aviation Administration (FAA) Airport Improvement (AIP) funding and local funds. This project was constructed with a very aggressive schedule in phases including nights and weekends, in order to minimize the impacts to the traveling public. Construction progressed continually despite adverse weather conditions and the need to build around the continual procession of arriving and departing passengers. Community relations were maintained via a ROC renovation website that provided continuous project updates and information on detours and traffic patterns. Airports across the nation are essential pieces to any economic development strategy. 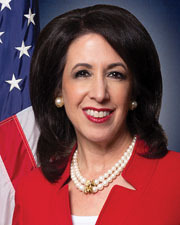 Monroe County executive Dinolfo has prioritized creating jobs and attracting investment to Monroe County a centerpiece of her administration, and ROC is no exception to that. In fact, according to the latest study available by the New York State Department of Transportation (NYSDOT 2011), ROC creates and sustains 10,000 jobs, generates $295 million in income and contributes $800 million annually to the local economy. These aren’t just individuals that work at the airport or for one of the airlines. They are business executives working in sales, finance, advertising, real estate, and the list goes on. 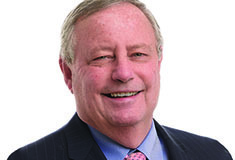 A modern airport is critical for individuals conducting business and communities intent on attracting new companies to invest there must have the amenities those companies are looking for. In the short-term, there is a tangible economic impact to the renovation project itself. The ROC renovation created almost 900 local construction and engineering jobs throughout the two-year project period and featured 20 bid packages, 14 prime contractors and 50 subcontractors. Located off Interstate I-390 and State Rd. 204 (Brooks Ave.), ROC leadership felt the airport signage was inefficient in notifying drivers they had in fact arrived on property. A new monument sign installed at the entrance now gives travelers a sense of arrival. Updated road wayfinding signage and energy efficient LED street light fixtures guide drivers to car rental return, arrivals, departures and parking facilities. A new SMART Phone Lot located pre-terminal has reduced curbside road congestion and provides ample parking along with an electric vehicle charging station, free Wi-Fi and a large LED flight information display screen with up to date flight arrival information and airport messaging. Under its term agreement with Monroe County, CHA Consulting, Inc. (CHA) was contracted to furnish engineering, design and construction administration services for the terminal renovations program. The terminal renovation portion of the overall project consisted of reconfiguration and expansion of the passenger security checkpoint, creation of a new passenger arrivals meeting area, expansion of the main terminal building near concessions, enhancement of concession offerings, implementation of communication technology for the deaf and hearing impaired and significant upgrades to the HVAC infrastructure. A redesigned six-lane passenger security checkpoint was constructed with input from the Transportation Security Administration allowing for 40% more space for passenger queuing, enplanement growth, carry-on luggage and extra space for passengers who use wheelchairs, strollers, etc. 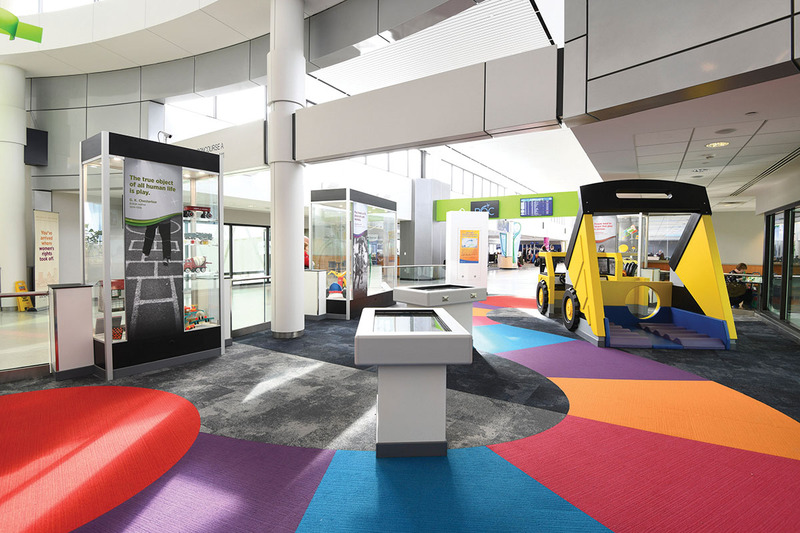 The terminal renovation project created two passenger interactive play zones in partnership with Strong National Museum of Play; the National Toy Hall of Fame near Concourse A; and the World Video Game Hall of Fame near Concourse B. These are conveniently located next to a new diner and sports bar at ROC. Exposure of the Strong Museum is essential to tourism since it is one of the must-see attractions in the region. The project addressed relocation of concessions to allow passengers to more easily see the options available and experience regional food offerings. 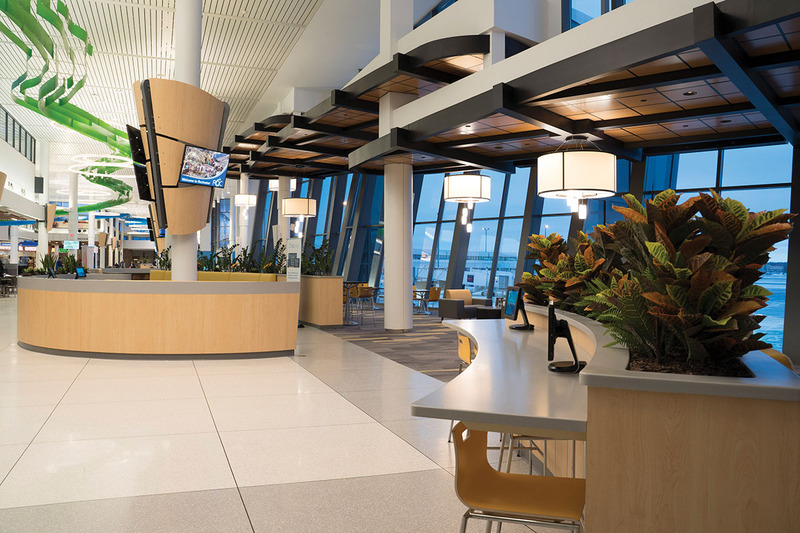 New shared lounge space was designed in the expanded main terminal expansion with floor to ceiling glass windows overlooking the airport’s north ramp for aircraft viewing. Over 1,000 new charging stations were deployed throughout this area and both concourses. 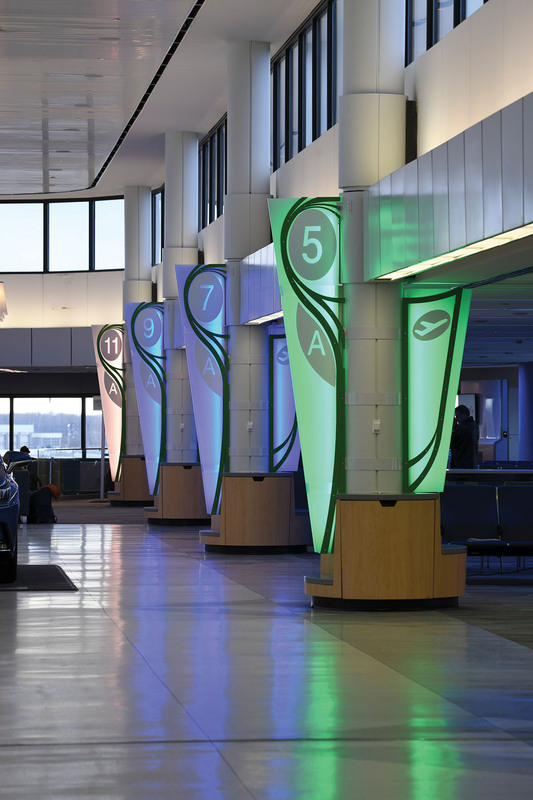 Lastly, newly installed systems at ROC help meet the airport’s energy efficiency goals through the installation of HVAC energy management and lighting management systems. The Flight Information Display Systems (FIDS) system provides a gate activity data stream to the Building Management System (BMS) which adjusts gate holding area ventilation rates to reduce energy consumption during idle periods. Many innovative 21st Century smart technology initiatives were implemented throughout the ROC renovation. ROC was the first airport in Upstate New York to install and test facial recognition and bag left behind technology at the terminal entrance canopy. This enhances safety and security while bringing the airport closer to a smart building approach. It also demonstrates the ability to implement this technology in any setting to improve the security of public premises. Monroe County is home to the highest deaf per capita population in the world, as well as the National Technical Institute for the Deaf (NTID) at the Rochester Institute of Technology (RIT). For this reason, the project introduced cutting-edge American Sign Language (ASL) to-Voice technology to assist the deaf with conducting transactions at airline ticketing counters, gate counters, car rentals and concession locations. Units are in the process of being deployed and will serve to translate ASL for improved communications between passengers and agents. New hearing loops and counter loops have been installed throughout the airport as well to assist hearing impaired travelers. These hearing loops include a specially-designed amplifier, which is connected to the terminal public address system and to a wire that is embedded in the floor. An electrical current is sent through the wire resulting in the generation of an electromagnetic field, which is received by a tele coil (or t-coil) feature, installed in a user’s hearing aid or cochlear implant. Counter Loops or point of service units, consisting of a microphone at specific terminal counter locations throughout the airport. The Counter Loop captures the sound of the customer service agent speaking, amplifies it, and delivers a wireless signal to a passenger’s hearing aid via their t-coil. Counter Loops are also located at every ticketing counter, car rental counter and gate counter to assist passengers with hearing loss. Other innovative technologies include communicative LED lighting in the gate holding area, as well as the creation and deployment of a passenger network called, “ROCview” accessible for free to passengers over free Wi-Fi that allows passengers to view in real time, from anywhere in the terminal on their personal devices or mounted tablets throughout the terminal, live gate cameras to view gate activity remotely without having to feel as if you need to sit within viewing distance of your gate. ROCview is designed specifically for travelers and provides a menu not only to view live gate camera’s but also food concession options and menus, terminal amenity maps, hearing assistive technology location maps, free games for passengers to play and flight information display integration. ROCview operates on a 50 GB bandwidth Wi-Fi network that is free to passengers and allows for more simultaneous users at increased speeds. Passengers can also access ROCview, the airport passenger information network using mobile devices while in the airport or via fixed tablets throughout the terminal. 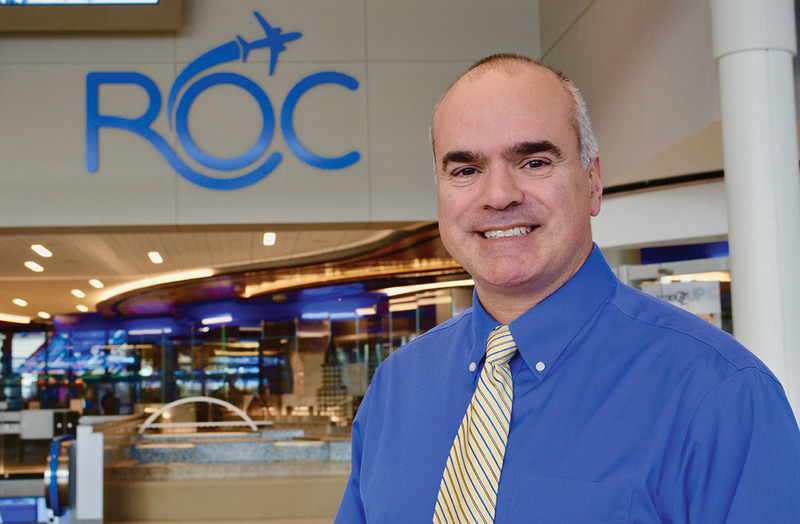 As a result of these efforts, ROC was named the 2018 Most Innovative Small/Medium Hub Airport in the U.S., according to the American Association of Airport Executives (AAAE). 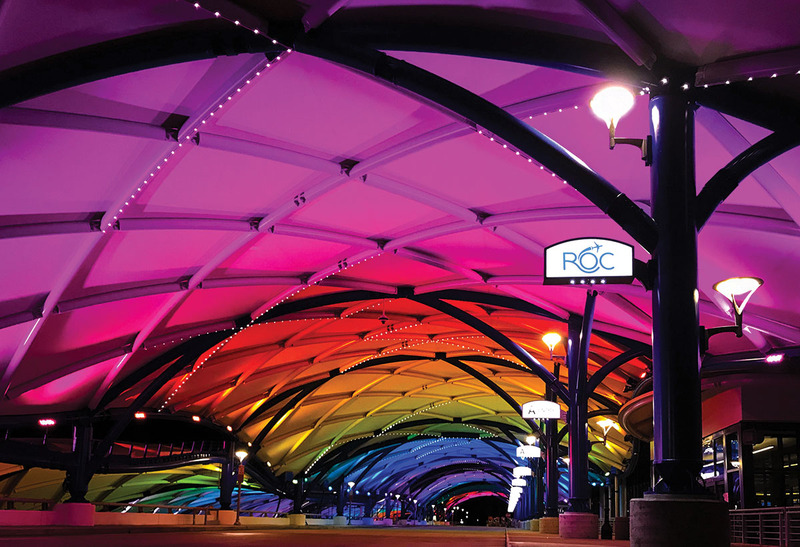 The traveling public was at the forefront in planning, designing and during construction of the renovations at ROC. Throughout the project the ROC Airport team maintained a designated website for weekly construction updates, impacts and feedback. Social media presence and ongoing project media events informed the traveling community of progress. The ROC renovation project was completed on time and within the project budget in an aggressive 24 months. The entrance canopy has enhanced the overall passenger experience by providing a more safe and comfortable entrance to the building, especially during the cold winter months when exposure to the elements can be challenging. The overall design revitalized airport circulation through a larger passenger security checkpoint, relocated concessions, new concourse design, reduced access points to the sterile areas, a new deplaning exit path and a single arrivals meeting area on the baggage claim level. Health and safety are as vital to a project as cost, quality or productivity. Airports are most concerned with safety and security for both the traveling public and employees. As part of the project team’s commitment to engineer safe solutions, the highest priority on safety training, policies and procedures was enforced. There were no major safety incidents and only 16 working hours lost due to a minor accident during the course of the construction. Congrats again on such a fantastic project!